Cycle 4 - Barbara Rankin Is back!! Welcome Barbara Rankin back to the eBrush Design Team!!! We are thrilled to announce that Barbara Rankin has returned for another term with CraftwellUSA's eBrush team!!! She is an outstanding artist and adds so much to our team! 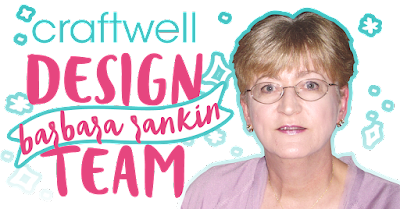 My name is Barbara Rankin, and I am so thrilled to be a part of the Craftwell eBrush design team. I am a self-taught paper and mixed media artist, with my early beginnings making cards and gifts for family and friends. I picked up my first rubber stamp in 1995, before the internet had so much inspiration to offer up-and-coming artists. I love to learn, and I love to share what I have learned with others. I love adding dimension to my projects, and just about everything I make has it in some form or fashion. I am currently on several other design teams: ColourArte, Gypsy Soul Laser Cuts, DecoArt Mixed Media DT, Altered Pages, and I also participate in the Craft Hoarder's Anonymous Monthly Blog Hop. I have also been on the House of Cards Monthly Challenge DT, Sin City Stamps DT, The Robin's Nest DT, and Creative Paperclay DT. I have been published in several paper and e-magazines, as well as a contributing artist in a book. I was also asked and have gladly made samples for display at CHA, as well as being a guest designer for Craftwell USA, Unruly Paper Arts, and Gina's Designs Lasercuts (aka Gypsy Soul Laser Cuts). I call Memphis, Tennessee, my home, which I share with my wonderful husband of 32 years and two adorable Yorkie sisters, all of whom make my life fabulous.